Sheep return to Savile Row! 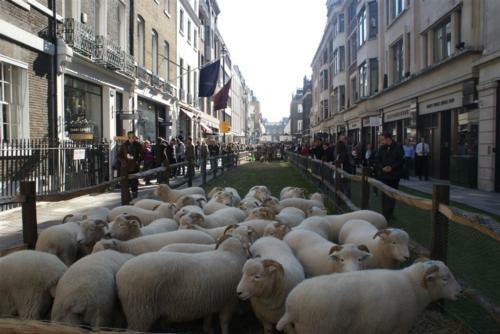 In two weeks’ time, on Monday October 5th, there will be a reprise of Sheep On The Row – the event that five years ago saw the Row carpeted in grass and covered in sheep. You can see coverage of that previous event here. It was a wonderful atmosphere. Sheep strolled peacefully, bespoke-clad shepherds tended casually to them, and all the bespoke houses had work on display – with their front doors open. The event is open to anyone to come along, though be warned GQ will be roving about taking street-style photos. It runs from 10am to 6pm and marks the beginning of Wool Week in the UK. For any young tailors and apprentices out there, a photo shoot is also being organised for the morning of the 5th, around the postbox on the corner of Burlington Gardens. Intended to celebrate the wealth of new talent coming into the industry, it is open to anyone to come along. 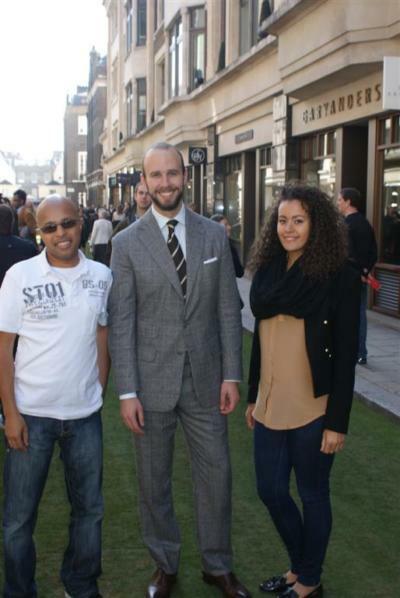 Email hello@sheeponsavilerow.co.uk for more information. You can follow the discussion on Sheep return to Savile Row! by entering your email address in the box below. You will then receive an email every time a new comment is added. These will also contain a link to a page where you can stop the alerts, and remove all of your related data from the site. On the subject of wool , is it ever acceptable to hav,e for example , a Pea Coat with 80% Wool and 20% Polyester? Or is wool able to withstand the worst of a Britsh shower? P.S. And no ,Simon. 5 years ago you also did not have hair . More the remnants of a shaven Mohican ! I’d always go with 100% wool. Polyester will be slightly more waterproof, but as long as you look after your coat (hang it up after wear, somewhere with ventilation and not near direct heat) it will be fine. Is this done in conjunction with the guys at Finisterre? I seem to remember they had something to do with the Bowmont sheep, I have a bennie made from their wool. Sounds like a lovely event, but isn’t pretty much all fleece used in all major tailoring fabrics now Australian or New Zealand derived? (With the obvious exceptions of Harris Tweed etc and other homespun tweeds). I was under the impression that was kind of a done and dusted thing and that British sheep farmers had long ago resigned to farming lamb solely for meat with the fleeces going into industrial uses, carpet etc, but the fleeces from these isles too coarse for clothing fabric. Ignore the hair comment Simon, the suit and the look are timeless. I haven’t noticed that particular a&s suit on your posts in recent times: do you still own/wear it? I recently bought a cardigan in geelong wool, but I am struggling to find any information about that type of wool. Does anyone know anything about it? Is it “animal friendly”? More durable? How does it compare to other types of wool? 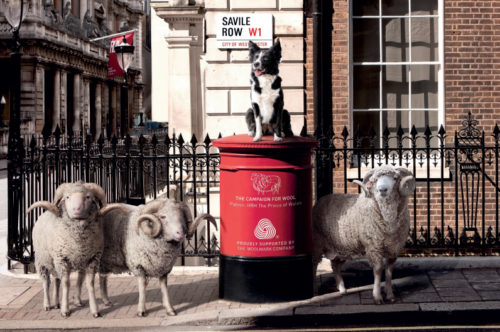 There have always been sheep on Saville Row. Most of them have two legs. It was only a matter of time before somebody made that very obvious joke so… thanks for being the one Richard. There’s an upside to every truism. But calling out the obvious doesn’t automatically disprove it (Logical fallacies 101).